People who use assistance dogs can be assured that Banbury taxis are accepting their business, as the law requires, following a spot check. An operation earlier this month saw Cherwell District Council work with the Guide Dogs charity to test licensed taxis and private hire vehicles in the Banbury area. All the drivers passed the test to see if they would allow an assistance dog and its owner to travel to their destination. 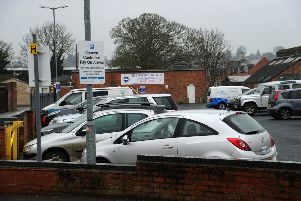 Two popular taxi ranks and three of the town’s most prominent private hire companies were tested. Clive Wood, who carried out the spot purchasing exercise with his guide dog Winnie, said: “It is not uncommon for us to hear from visually impaired people across the UK, that a taxi provider has refused to take them because they have a guide dog. “We want to get the message across that a guide dog is a vital mobility aid and it is illegal to refuse a service to a guide dog owner. Under the Equality Act 2010 and taxi licensing legislation, it is illegal for a licensed vehicle to refuse passage to an assistance dog and their owner. Drivers who refuse service to a person travelling with an assistance dog, or charging them extra, risk prosecution, fines of up to £1,000, and having their licence revoked. Cllr Andrew McHugh, Cherwell’s executive member with responsibility for licensing, said: “It’s vital that people living with disabilities be able to count on a professional and reliable taxi service. This spot-check shows how seriously we take this issue and the success of the training we run. Cherwell’s ‘Rate My Taxi’ initiative allows customers to provide feedback on the quality of service they receive, based on a short survey. Passengers can access ‘Rate My Taxi’ via a QR code displayed in participating vehicles. For more information email licensing@cherwell-dc.gov.uk or call 01295 753744.